Uncooked prawn crackers catering size, multiple colours. Prawn crackers are deep fried crackers made from starch and prawn that serve as flavouring. They are a popular snack in parts of Southeast and East Asia. Prawn crackers or shrimp puffs are a common snack food throughout Southeast Asia, but most closely associated with Indonesia and Malaysia. Product of China. 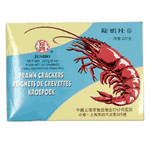 Ingredients: Food Starch, Refined Cane Sugar, Refined Table Salt, Whole Shrimps, Monsodium Glutamate. Directions: Heat vegetable oil in a frying pan until it boils, fry prawn crackers. Wait until they float and expand. Drain oil.